The MiG-29 was the Soviet Union's first publicly visible 4th generation jet fighter, making its Western appearance in Finland in 1986 and a bigger display at Farnborough in 1988. Since then the MiG-29 has filled the ranks of Russian fighter units as well as air forces around the world. Today, the MiG-29 can be found throughout Asia, Africa, and South America. 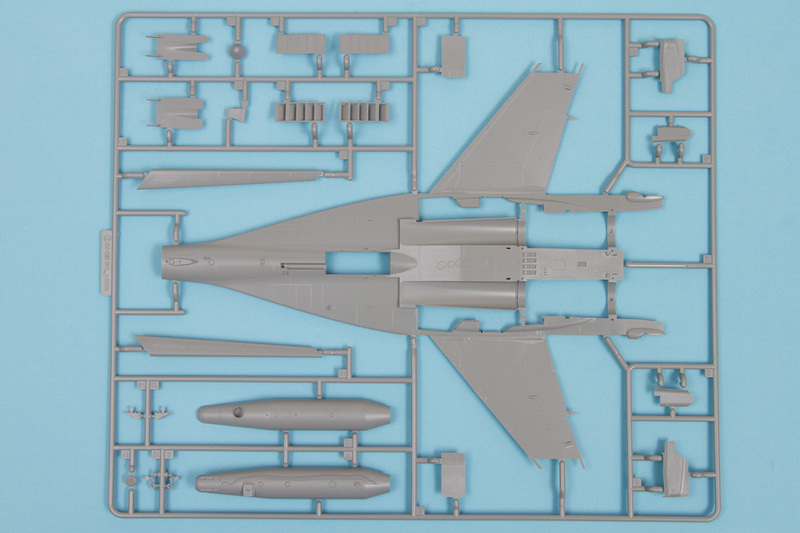 For a long time, modelers have been wanting a good 1/48 MiG-29 kit. The existing kits out there were all based on limited information, and while good for what they had to work with, they fall short in accuracy and fidelity. 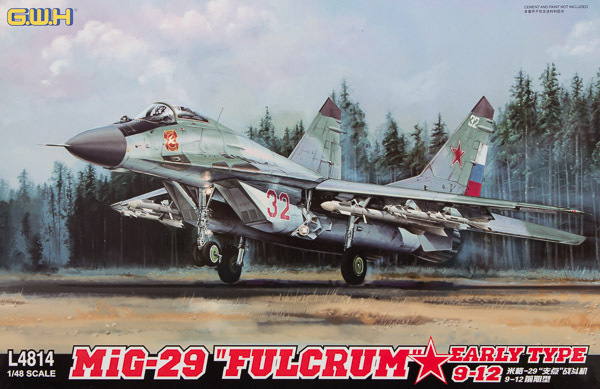 Great Wall Hobby has turned things up a bit (all right, a lot) with a whole slew of MiG-29 variants, and finally we have a beautiful 1/48 Fulcrum. Molded in light gray plastic, the kit is superbly engineered, well researched, and full of great details. Before jumping into what all the kit comes with, a word needs to be said about the packaging of this kit. This kit comes with some of the most protective packaging I've seen in quite some time. The main upper fuselage piece has its own box, to protect all its various edges from damage. 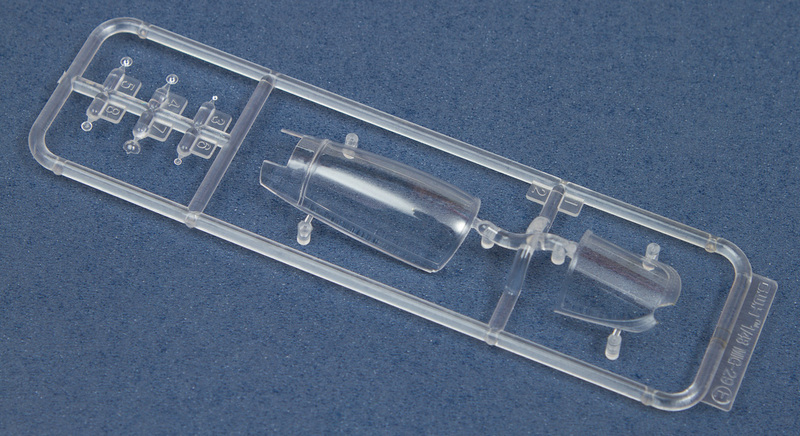 The various sprues are carefully bagged in resealable plastic bags. The clear parts are in a resealable bag, with a separate adhesive pad on the main canopy, and all of that is in a foam bag. Finally, the weapons, which are exquisitely molded, are carefully protected in a two-piece molded shell. Some might think this is overkill, but given the amount of work put into this kit, I am not surprised that Great Wall Hobby wanted to protect it well. So, jumping into the construction, let's look at the cockpit. This is generally the first stop for the aftermarket crowd, but this one will look great straight out of the box. The ejection seat is made up from over a dozen plastic and photoetch parts. The cockpit itself is made up from a separate floor and separate side walls, which also get additional details carefully molded to provide the highest level of detail. The instrument panel gets separate decals for all the instrument faces, and when finished will rival the best photoetch panel out there. On the outside, there are separate details for the area behind the seat and the heads up display. All told, you'll be spending quite a bit of time in this area and the kit parts will look outstanding when done. Moving on to the other interior bits, the wheel wells are made up from multiple pieces as well, again to ensure sharp details throughout. You'll also have to open up some flashed over holes in the wings and fuselage centerline if you want to add pylons. With that sorted out, add the cockpit and you can get the top and bottom pieces together. These incorporate the wings, but the flaps, ailerons, and slats are all separate. Similarly, the rudders are separate for the vertical fins, and the stabilizers can also be positioned any way you want to. 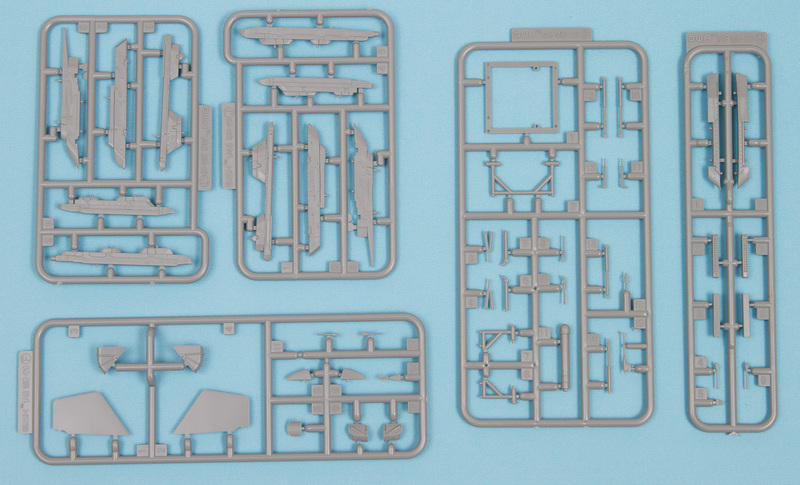 For those who love details, this kit comes with some nicely detailed Klimov RD-33 engines. Yes, you get two of these, and while you don't necessarily need to display the entire engine, the intake face and exhaust pipes are both excellent renditions. The intakes are made up from multiple pieces, but for those worried about seams, don't be. The MiG-29 has large blanking plates that cover up the intake when on the ground, so you won't have to worry about that. The rear engine covers are also separate, and have several external details that need to be added. Going to the nose, the nose cone is separate and features a separate pitot tube. There are several other probes and antennae waiting to be added as well. The canopy can be displayed open or closed, and has all the requisite hardware to display it properly. There is no mention of nose weight, so you will want to check to see if your build needs an extra little help to keep it on all three. Speaking of landing gear, these are just as well detailed as the rest of the kit. The kit even includes alternate nose gear arrangements, one for the prototypes and one for the mass production variants. Check your references to see which style you might need. The main gear is simple and sturdy, and for both the nose gear and main gear, the wheels feature separate hubs and tires to simplify painting. For stores, you get three types of missiles and two types of fuel tanks. There is a centerline drop tank and two wing drop tanks, two R-60 missiles, two R-73 missiles, and two R-27R missiles. The drop tanks are molded in halves, while the missiles are molded as single pieces. The latter is truly remarkable and has to be seen to appreciate. The engineering is superb, taking full advantage of slide mold technology to not only give all the fins beautiful detail, but give the sensor heads and rocket engines detail and depth. 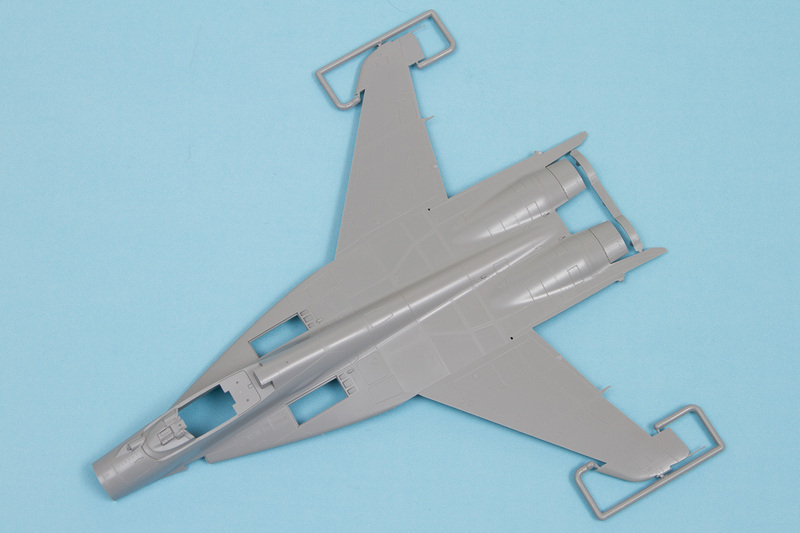 The pylons are also nicely detailed, and it would be a travesty to not load your MiG-29 up with a full complement. For markings, the kit comes with three schemes, all Russian and all finished in the two-tone gray camouflage scheme. The first is Red 32 from the 960th FR in 1997. This plane has the white, blue and red rudder and a unit emblem on the nose. The second one is Red 07 from the 968th FR at Altenburg airfield in East Germany in 1990. This plane is more simply marked, with just the number on the intake and tail and the Mikoyan flash on the nose. Finally we come to the most colorful on the sheet, Red 01 from the 1521st FR of the Soviet "Top Gun" program. This plane has a sharkmouth on the nose and a large bumblebee on the tail. In addition to the aircraft markings, the decals include comprehensive stencils for both the aircraft and the weaponry, adding another level of realism to the finished model. 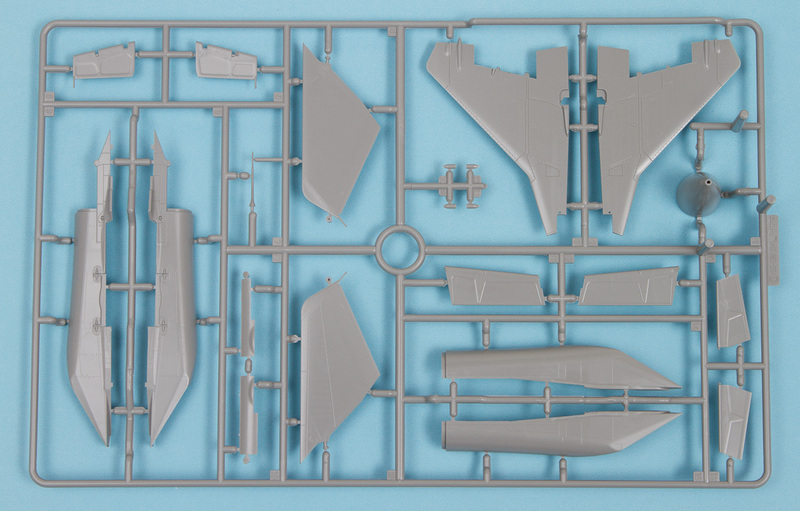 If you have any desire to build a 1/48 MiG-29, do not bother looking at any other kit. This is so far beyond the competition that it just isn't worth looking at those older kits. 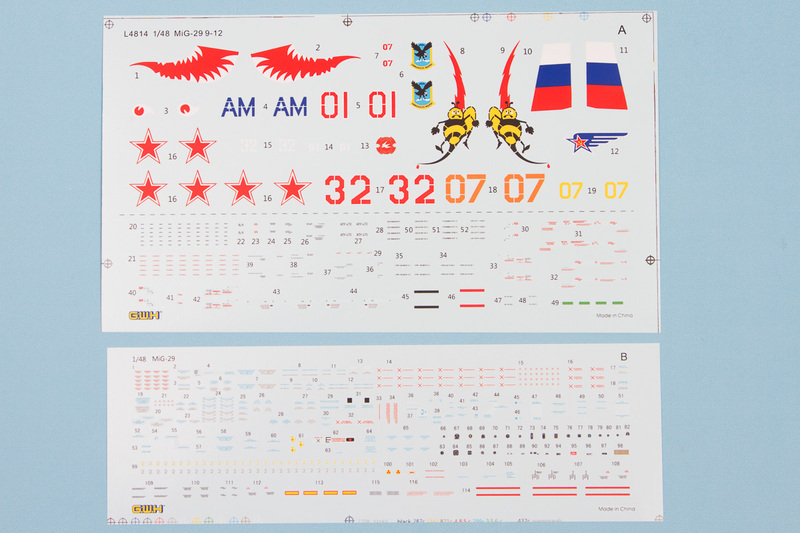 I am sure we will see quite a few aftermarket decal sheets in the near future for this as well, and given the wide range of nations operating the MiG-29, there will be no shortage of great schemes out there. My thanks to Dragon USA for the review copy.